We have a couple of plants labelled Cymbidium simulans which is given as a synonym of Cymbidium aliofolium and is a warm growing cymbidium. We have seen Cymbidium aliofolium growing abundantly in seasonally dry hot forest in Sikkim, where as plants referred to as Cym. simulans are from Myanmar, Sumatra and Java. 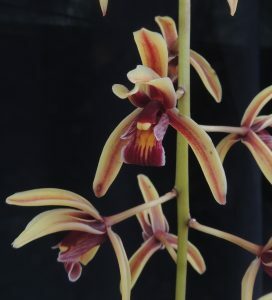 We like to keep the plants separate and keep the simulans label as the plants we have differ from our plants of Cymbidium aliofolium by being smaller and by having flowers with much more yellow in them and flowering at a different time of year.